The concept’s main advantages are its operative flexibility, and the fleet’s competitive CAPEX and OPEX costs. The pusher tug makes all the units mobile and transportable. The number and choice of units will depend on the project, since not all of the concept’s units are necessarily needed for every project. For example, the concept can be utilised to act as an LNG carrier (using only the pusher tug and LNG storage barge), or it can be used for more complex projects involving liquefaction and regasification systems (using all units). The modular design of Wärtsilä’s liquefaction and regasification units makes this an ideal concept for gas plants in the 50-200 MW range. The low draft design also makes it very attractive for gas power plant projects in South East Asia. “We have worked together with Wärtsilä for many years in various marine and offshore projects. Wärtsilä has the technical leadership and a broad portfolio of products and solutions in LNG systems for marine applications, and is a partner that we enjoy working with. 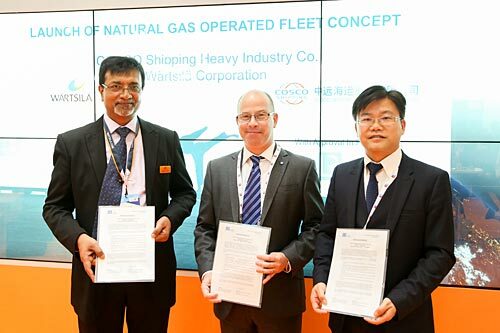 This natural gas operating fleet concept is a new and exciting development, which should bring extensive customer benefits. CHI will continue to focus on LNG related business, and extend its market influence, research and development for LNG projects,” says Mr Zhao Zhijian General Manager of CHI technical R&D centre.